The new X-Files movie will tackle themes of religion, weird experiments, and things that make you go eww. The back-cover blurb for the movie's novelization went online and finally explained just why the movie is called I Want To Believe. Not to mention clearing up all of those little clues, like the picture of Mulder and Scully in a church, and Billy Connolly leading the feds through the snow in the trailer. Click through for spoilers. When a group of women are abducted in the wintry hills of rural Virginia, the only clues to their disappearance are the grotesque human remains that begin to turn up in snow banks along the highway. With officials desperate for any lead, a disgraced priest's questionable "visions" send local police on a wild goose chase and straight to a bizarre secret medical experiment that may or may not be connected to the women's disappearance. It's a case right out of The X-Files. But the FBI closed down its investigations into the paranormal years ago. 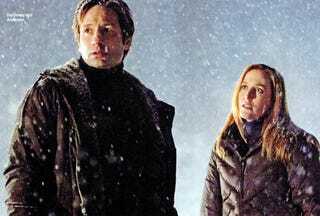 And the best team for the job is ex-agents Fox Mulder and Dr. Dana Scully, who have no desire to revisit their dark past. Still, the truth of these horrific crimes is out there somewhere...and it will take Mulder and Scully to find it!